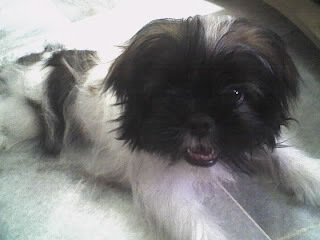 .Mom picked my name because her favourite actor, Jake Gyllenhaal, has a dog name Boo too. But later in my life I realized I'm such a big flirt, and I added Casanova to it. Mom brought me home because Daddy was late coming home AGAIN (mom made me say that) that nite. Out of anger and her impulsive behaviour or my lucky day, Mom went to a pet shop thinking, "If I can find a dog that's under 1K, I'll take it home with me regardless how unhappy Daddy would be." WHAT? So Mom walked into that tiny pet shop and saw me. Ok, not exactly. She saw the Poodles next to me first. She was interested in them and asking about them. It turned out they were a little more expensive than me and she said, "What about the one next to it?" The pet shop owner took me out of my crappy cage and put me in Mom's hand. I was quiet, very quiet. Mom put me down. I was so happy I'm out of the cage, I ran. Later I found out Mom picked me because I was quiet. You see, my humans were living in a condo. Dogs are not allowed, but Mom brought me home anyway. Good for her. So when I didn't make a noise, she thought, "Perfect! I could just bring him in without anyone noticing." When I reached home, my Daddy was already home. He was surprised to see me. He pulled his face as long as a horse. But I ignored him coz I was so surprised by my new environment. I just wanted to sniff it. The TV was on so I sat on Mommy's lap and watched it. Because Mom was not well-prepared for my arrival, I had to sleep in my carrier on the first nite. They were afraid I might have "accidents" all over the house. Yeah Rite! I peed and pooped in the carrier. I stunk! Daddy had to bath me the next day. I was not a happy camper, but I didn't complain. Overall, my first nite was concluded with "confuse, confuse and more confuse." But not after a week or so. I'm the Prince of the house now and I boss everydog and human in the house around. You certainly are the prince of the house! We just love your name and want to snuggle with you, Boo!